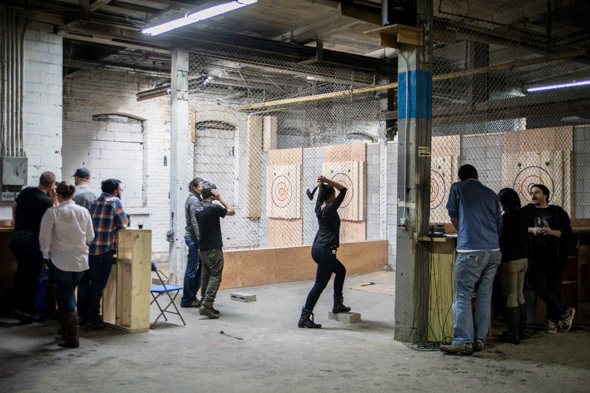 The Backyard Axe Throwing League (BATL Grounds) has come a long way from the backyard. So far, in fact, that its new 7,000-plus-square-foot second location is an industrial-sized space nestled between film warehouses and production studios in a complex off Cherry Street south of Lake Shore Boulevard. 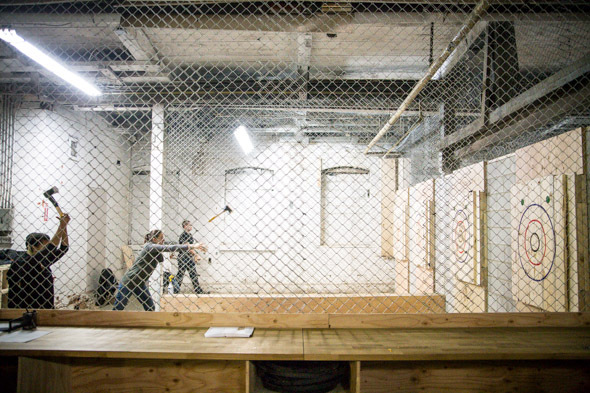 The popular axe hurling league opened 'BATL Grounds' at 33 Villiers Street in December 2013 and now operates two locations, effectively putting an end to the league's current waiting list. BATL Grounds has four sets of four lanes, a vast expansion from the single set at its still-open 1,400-square-foot location on Sterling Road . 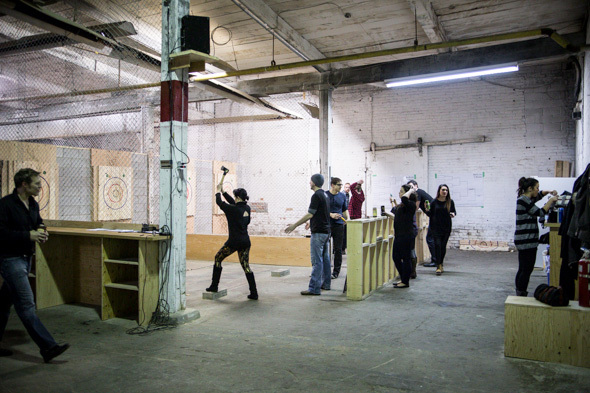 Upon entering, participants quickly get used to the smell of sawed wood and freshly-sharpened steel and the cacophonous sound of axes chopping or bouncing off targets, and the echoes doing the same off the high ceilings. Founder Matt Wilson didn't do a hatchet job on the construction, either. Solid, straight lines divide the space into distinct throwing areas. Many BATL staff members are league veterans, and most look like warriors from a J.R.R. 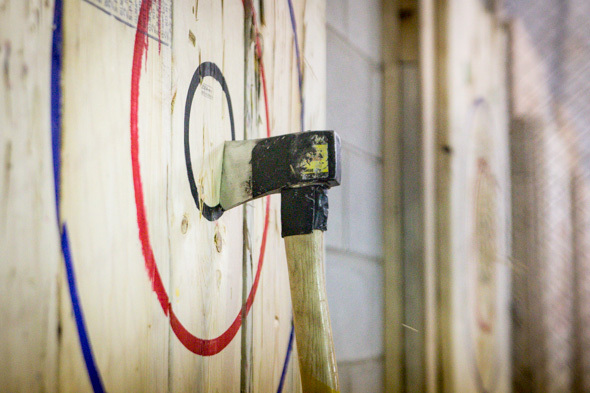 Tolkien novel - adding to the sense of toughness you might expect in an axe throwing environment. 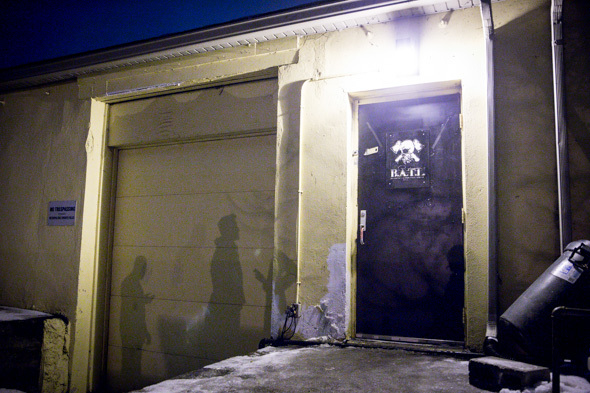 But beneath the hard-bitten veneer is an organically grown, word-of-mouth community that fosters a family atmosphere at BATL Grounds. "We're doing league expansion right now in a big way," said Wilson, who started BATL in a backyard off Manning Street in Little Italy. "We could have as many as 120 people throwing every night." All 120-plus current league members who throw at Sterling Road all know each other, and Wilson hopes that will remain the case as the axe-wielding family grows. For those twiddling their axes on the sidelines while the growing waiting list kept many out of the popular sport, the chance has come to get in on league play. BATL Grounds can also help with event requests at the Sterling Road location, which books 12 weeks in advance for Saturday private parties. 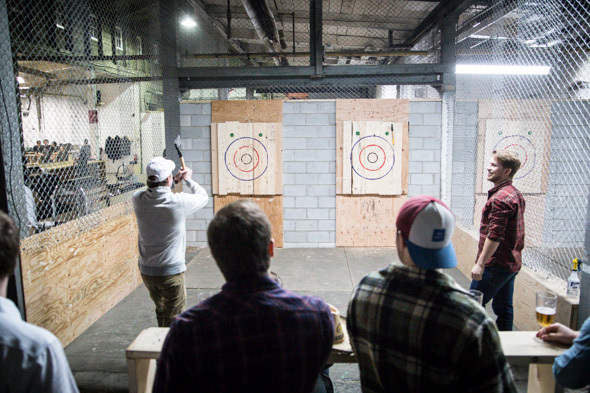 BATL Grounds is used for both league play and private events. Events include coaching and practice followed by a round-robin tournament and a playoff final. The cost for events is $40 per person with a 12-person minimum. 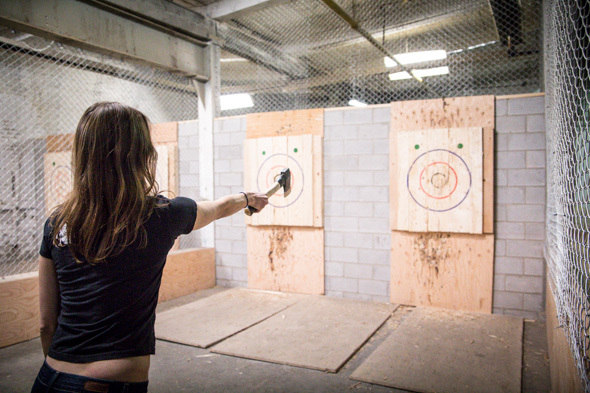 A standard event at BATL lasts for about three hours. "With this place now our plan is to have three arenas operating for events and league and one arena of four lanes free for league members to come do drop in and practice, which is something we could never do at the other space," Wilson tell me. The new space, like the old, does not serve alcohol but is BYOB - the only rule is no hard liquor and no glass. It’s that time again! 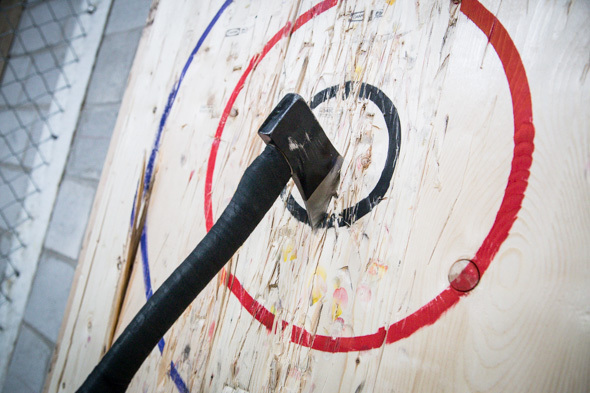 Join us for FREE axe throwing at all BATL locations during our public open houses taking place on Friday, 3 May. 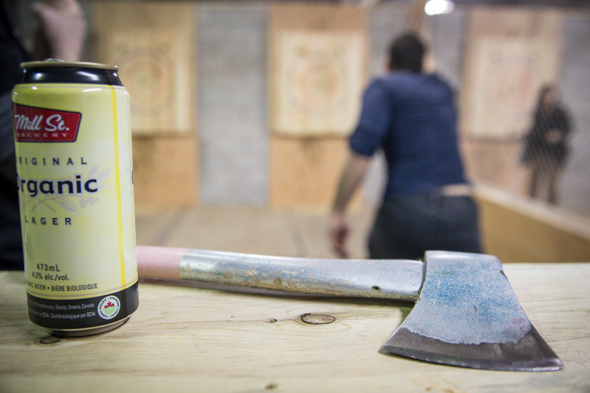 Stop by anytime between 6 - 10 pm (local time) to learn how to throw an axe and have a great time with friends & family.